A plain-English guide to teaching phonics. Every parent can teach reading; no experts need apply! Take charge of your child’s literacy with this jargon-free phonics guide. Too many parents watch their children struggle with early reading skills — and don’t know how to help. Phonics programs are too often complicated, overpriced, gimmicky, and filled with obscure educationalese. 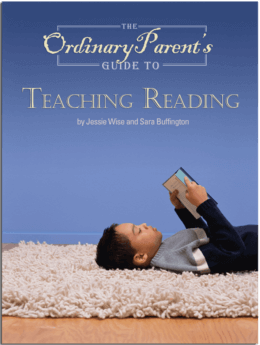 The Ordinary Parent’s Guide to Teaching Reading cuts through the confusion, giving parents a simple, direct, scripted guide to teaching reading — from short vowels through supercalifragilisticexpialidocious. The Ordinary Parent’s Guide to Teaching Reading is user-friendly, affordable, and easy to follow — supplying you with everything you need to teach reading in one book. Clarification: we do NOT offer a guarantee that children who learn phonics from The Ordinary Parent’s Guide to Teaching Reading will win the spelling bee. We only guarantee that they will grow up to be avid readers with fantastic grades who get into elite universities, then proceed to change the world with their creativity, erudition, and passion, while respecting rich and poor alike, and calling their parents at least twice a week with genuine gratitude and in-depth updates. That’s all. Just wanted to clarify that, so as not to raise unreasonable expectations. I have friend who is step mom to a 10 year old who cannot read – would you recommend this book for an older child who is already in the public school system? Would they skip some of the earlier parts? Or is there another guide you would recommend? Yes, this program can be used (and has been successfully used) with children in similar situations. Depending on the child’s level of knowledge about the alphabet, you may be able to move rapidly through the earliest lessons. There is also a short section in the back of the book called “Remedial Reading With an Older Child,” which your friend should check out before she begins teaching the material. Is this a good book to use to supplement other programs? I have a program I’m using which I like, but my child still struggles with some areas and I’d like extra ideas. Would this be a good resource for picking up extra ideas from? Or would it be hard to use this non-sequentially? This program is designed to be used sequentially, but it could be used to supplement another program as well, yes. We appreciate this program so much; this is the best reading program we have found for a number of readings: the daily lessons are short and well-planned, the lessons are logically sequenced, the lessons are appropriately contextualized (none of that nonsense about memorizing sight words before one learns to read), and parents are given a great deal of support throughout the book. I love programs that empower parents and children to determine how learning takes place. You can start this program when your child is 4, 5, 6, or 7, even. You can learn a section at a time, taking breaks in between, or just keep on going, steadily, day by day. The activities are short, fun, and effective. Both of my boys love being able to play language games, jump on word cards, make silly sentences, and go on reading-based scavenger hunts (all of which are in this book). The price is more than fair for the value of what you actually receive from this book; the book can be used for one child after another, so that is an added money saver. I recommend this book to everyone who is looking for a reading program because all children will benefit, whether they have learning differences or are intellectually gifted. I am currently using this book very successfully with my 4yo son. The back of the book states that it is for use through fourth grade. I’m curious if you could give me any indication of which lesson roughly correlates with completion of each grade level. I know every child’s development is very different but any information you could give would be helpful for future planning. Also, do people typically continue using the book for several years? Thank you! Hmmm. When the child successfully finishes using the OPG, he/she is reading on a 4th-grade level, but it doesn’t mean it would take four years to complete. First graders would probably take a year to a year and a half to complete the book. Someone starting at four years old, like your son, might finish by the time he’s 6. The book does not have exact pages/lessons that we can point to as the end of one grade and the beginning of another. As well as the introduction in the book itself. This book goes into each sound so well – I’ve considered bringing some lessons to my students in 11th grade in public school! I’ve had to learn how to move at the right pace for my kindergartener (even slower than 2 review, 1 new pace – we’ve repeated and repeated so many times!) but the stories have enough variety in content to keep him reading. We also do Bob books and other early readers from the library to supplement “lessons”.